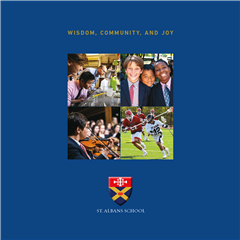 For more than a century, St. Albans School has been a place where boys come to learn and grow academically, physically, and spiritually. We offer a distinctive educational experience for young men in grades 4–12, with opportunities for coordinate education beginning in grade 7 and continuing through grade 12. Our students strive to reach exceptional academic goals and exhibit first-rate athletic and artistic achievement. As an Episcopal school, we place equal emphasis on moral and spiritual education. Our students value lives anchored by spiritual understanding, and they look to serve the communities beyond where they live. We seek to admit young men who will add to the vitality and diversity of the school. We are committed to a need-blind admissions policy, which ensures that a St. Albans education is accessible to qualified boys regardless of their families' ability to pay. Our strong financial aid program enables us to meet the full demonstrated need of every admitted student’s family. St. Albans School admits students of any race, color, creed, ethnicity, cultural background, economic circumstance, human capacity, or sexual orientation and grants them access to all the rights, privileges, programs, and activities generally accorded or made available to students at the school. St. Albans does not discriminate on the basis of race, color, creed, ethnicity, cultural background, economic circumstance, human capacity, or sexual orientation in the administration of its educational policies, admissions policies, financial aid and loan programs, and athletic or other school-administered programs.